The new MI-6 Waterproof Pinpointer Metal Detector has a wide range of innovative features compared to other products currently on the market. 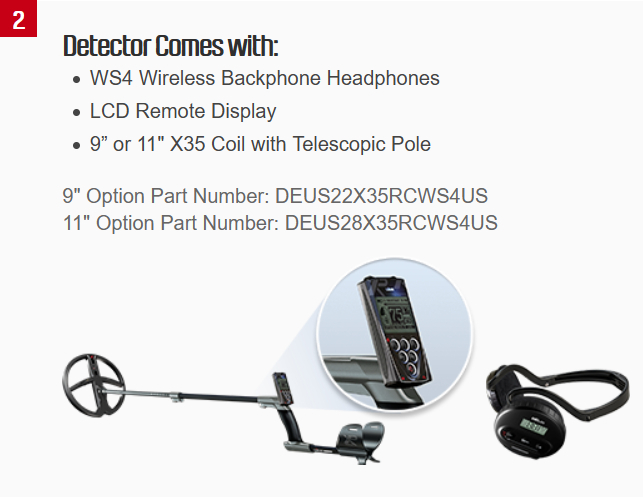 Use by itself OR wirelessly with the XP DEUS metal detector. OUR PRICE $68.00 Plus $8.75 shpg. The under water kit allows every DEUS owner to take the "XP Plunge" by waterproofing either the remote or the WS-4 control pod. Included in the kit is everything needed; 1. 8 Foot Aerial Antenna, 2. Waterproof Case with XP Logo, 3. Waterproof Headphones and 4. Volume Control. Rated for snorkeling and diving to 5 meters. The DEUS is now a true all around detector - Coins, Jewelry, Relics, Gold Nuggets and now waterproof for Shallow Water and Diving! See the video here! The XP DEUS is now available for the first time in North America. 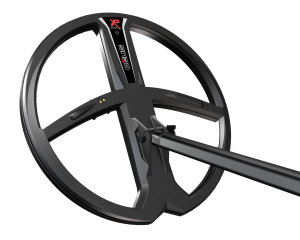 Detector Electronics Corp. is pleased to have been selected by XP Metal Detectors of France as the Distributor for the XP brand of Metal Detectors. Read on to discover why world-wide demand for the XP DEUS has been tremendous. Form Meets Function: The XP DEUS Is An Exciting Blend Of Art And Science! Take just one look and you will quickly understand that the DEUS (pronounced day-uhs) is unique. Weighing in at just 1 pound 15 ounces, the XP DEUS is not just elegant in design, but also revolutionary in performance. "This detector is like nothing treasure hunters in North America have ever experienced before" says Michael Bernzweig of Detector Electronics Corp. He adds, "The XP DEUS is truly unique in every facet of its design and performance". While XP has been manufacturing the DEUS for over a year, the demand for the product has far outpaced production capacity. With the recent addition of a new manufacturing facility in Southern France, XP has agreed to begin supplying Detector Electronics Corp. customers with a limited number of DEUS detectors in the coming months. What is so special about the XP DEUS? 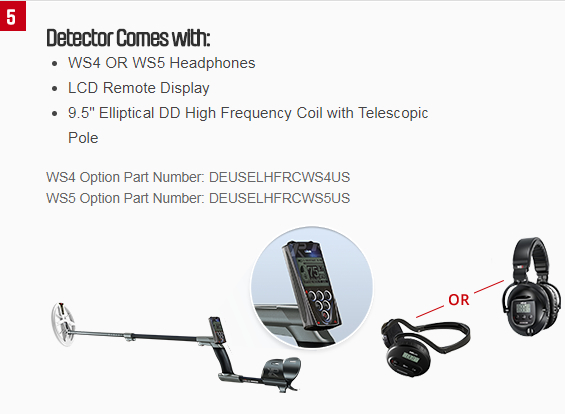 Read on and you will begin to understand why this product has quickly become the hottest metal detector throughout Europe and abroad. The Wireless XP Search Coil Sets You Free: No More Wires To Snap, Cut, Break or Get Tangled! 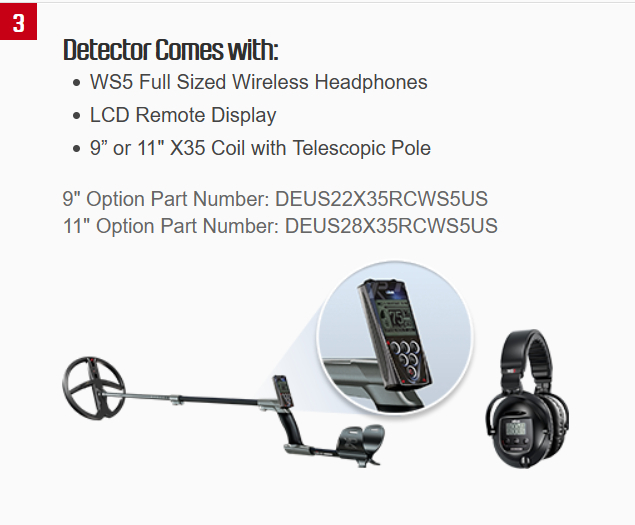 The DEUS metal detector achieves superior power, speed and precision, all in a lightweight and compact design. The XP search coil contains all of the essential components for processing the target signal. Stated simply, the entire detector is built in to the search coil! Unlike conventional metal detectors, the signal no longer requires a wire to convey the signal. The target signal is simply digitized and analyzed instantly and directly at the source by an ultra-miniature digital circuit. This revolutionary new design significantly improves the quality of signal acquisition. 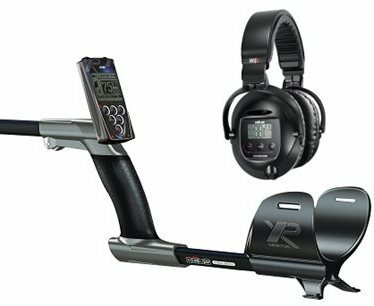 The signal is processed in the search coil and then transmitted wirelessly to both the headphones and remote display screen. Forgot Your Headphones or Remote at Home? Not a problem! The headphones and the remote display screen each operate independently. For example, let's say that you want to hunt with just the headphones. In this configuration, without the remote display, the detector slims down to a mere 1 pound 15 ounces. 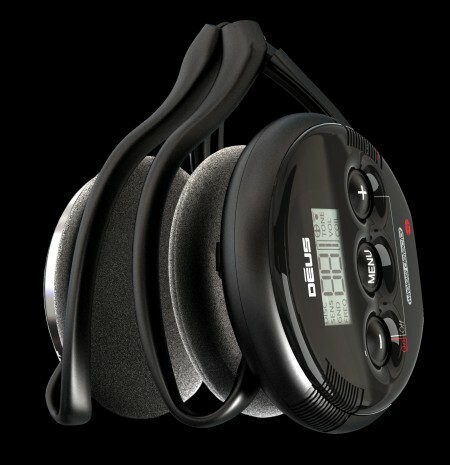 The headphones allow you to control the most important features of the DEUS detector. You can adjust the following settings: Ground Balance, Frequency, Discrimination, Sensitivity and all of your custom programs. You can hunt with the preset programs or any custom programs that you may have created with the remote display screen! Like the DEUS detector, the XP Wireless back phone headphones are designed for extreme use. Like the arm cup, the headband was designed specifically to endure the rigors of treasure hunting. Every component was designed and custom molded specifically for metal detecting. This is not just an off-the-shelf headphone adapted to the application of metal detecting. Three simple controls on the ear cup allow you to control the detector: a menu button, a plus and a minus button. The headband rests securely and comfortably behind your head. Do you like wearing a ball cap while treasure hunting? You can with this design. You will find these headphones to be so light and comfortable that you will forget that you are wearing them! 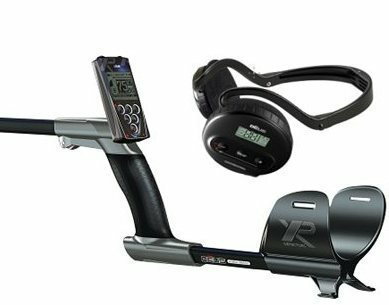 All of the electronics, including the digital LCD Display, are encapsulated in a weatherproof disc on one side of the XP headset. Concerned that you might snap the headband in half and ruin your headset? You won't, but let's just say that happened. Not a problem! Just slide the electronics off and snap a new headband on. 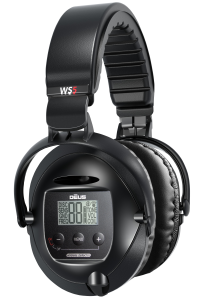 The smart design of the DEUS Wireless headset allows you to be back up and running quickly and at minimal expense. Extreme Depth & Fast Recovery: Find What Others are Missing! 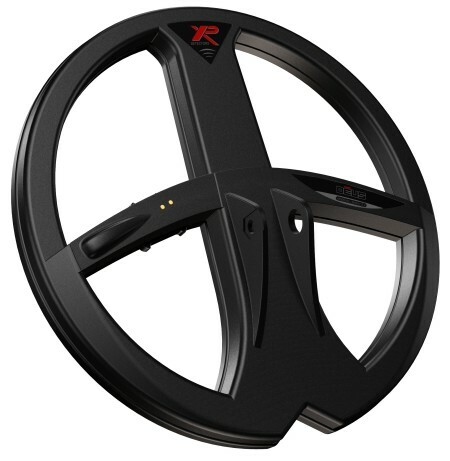 The DEUS allows the user the ability to adjust the power and target recovery speed. Compare this to any of the top metal detectors on the market and you will be amazed at just how fast the DEUS is. The benefit to a quick response is the ability to locate multiple targets that are buried in close proximity to one another. Now you can head back to all of those worked out areas and discover what others have missed. 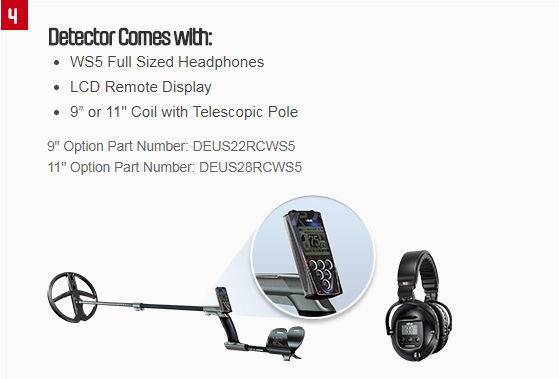 The wireless digital display remote control comes in a handy hip mount case. Just toggle through the intuitive menus and adjust the following: Audio Response, Iron level, Multi tone, Notch, Discrimination. Tired of complicated ground balance procedures? The XP DEUS allows you to easily select the type of ground balance that works best for your style of treasure hunting. Intuitive on screen graphics walk you through the procedure. Choose from: Tracking, Pumping, Manual and Beach ground adjust options. Buy It Once; Upgrade it for Life - An Industry First! 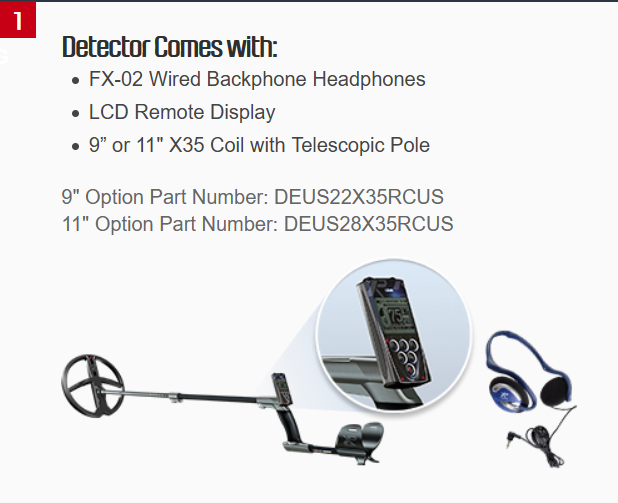 Upgrade your DEUS metal detector with software updates anytime, now or in the future. Just visit the XP website where you are entitled to download the latest features. The best part is that the update process is so simple, any grandmother could do it! Just plug the USB cable into your XP remote and the other end into your computer. Follow the onscreen prompts and your detector will be updated quickly. Now there is no need to buy one detector for coin hunting and yet another for prospecting or relic hunting. The XP DEUS is like having multiple detectors in one. 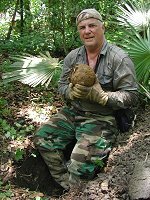 There is no need to purchase a separate detector or search coil for each type of hunting. 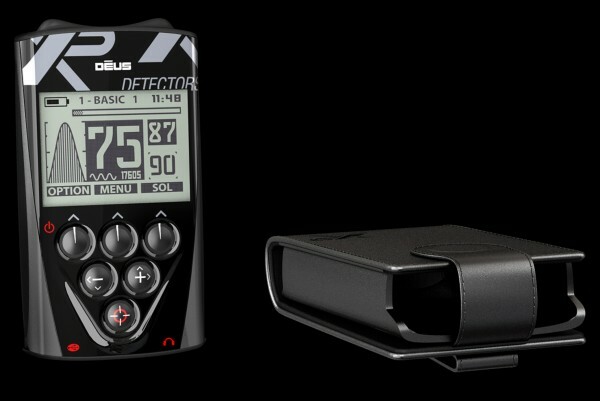 You can adjust every characteristic of the DEUS detector including the frequency. Select your frequency from the preset options of 4 kHz, 8 kHz,12 kHz and 18 kHz or you can use the plus or minus keys to more precisely, fine tune each of those frequencies. Pictured above, XP Technician Julien (Right) and Michael (Left) of Detector Electronics Corp. Michael is getting a sneak peak at the new version 2.0 software in the XP Deus Wireless metal detector, while visiting the XP factory in Southern France. Just Choose your Program and Start Hunting! We love the fact that anyone can just pick up this metal detector and start hunting right away, in one of the 9 preset programs. The preset programs include the following modes: wet beach, dry beach, prospecting, relic, coin hunting and four other popular preset options. More advanced users can use the expert menu to create custom programs and features. The DEUS is easy to use yet offers enough advanced options to satisfy the most seasoned treasure hunter. Standard Headphone: Weatherproof, Wireless Backphone, Built In Operational Controls And LCD Display Screen. Charger Specifications: Single Fast, Intelligent Charger, Simultaneously Charges The Headphone, Coil and Battery. The genius behind the design is that all three devices communicate with each other via a digital wireless radio signal that was developed specifically for metal detecting. The technology is so unique that it has been patented. Unlike other forms of wireless devices that simply use off-the-shelf wireless technology to communicate, the DEUS was designed from the ground up. The advantage to this unique design is crystal clear audio and extremely efficient power consumption. The XP DEUS features a Superior Ergonomic Design. The new patented stem design (shown below) allows you to quickly deploy or store away the detector. The handle was designed with total body ergonomics in mind. This configuration is much easier to handle than a straight stem. Both seasoned treasure hunters and beginners alike will be amazed at the comfort of this exciting new design. Simply put, you can set up or fold away the stem quicker than you can say DEUS! The molded rubber handle is manufactured using the same techniques used to create stick shifts found in some of the world's most advanced racecars. You will quickly discover that this molded rubber handle is extremely comfortable and offers an improved operating angle. No more worn out foam handgrips, truly a unique concept! The arm cup is made from a space age plastic resin that is designed to endure the rigors of extreme treasure hunting. We found that you can twist it like a pretzel (yes, we actually tried) and it simply refuses to break or crack. The DEUS ships complete with a search coil cover and both a standard set of coil hardware and an extra backup set just for good measure. With the worldwide success of the new XP DEUS Wireless metal detector, XP recently built a new production facility in Southern France to keep up with demand. XP Metal Detectors are produced using the most advanced manufacturing techniques. The facility was designed to be environmentally friendly. To this end, solar power and other alternative forms of energy are used for heating and cooling.